To enhance the quality of the teaching, SOS Children’s Villages Haiti is focused on building teachers’ capacities through teacher training and providing adequate infrastructure, such as school libraries, computer rooms and counseling for children. Additionally, class sizes in SOS schools are limited to 35 pupils. Robenson Claude, the Family Strengthening Program National Coordinator for SOS Children’s Villages Haiti calls these rural areas “the other Haiti”. “There are kids in the other Haiti, the second Haiti, who must walk 15 to 20 kilometers every day to go to school. There are families that have to walk many kilometers with buckets on their heads just to have access to water,” he explained. 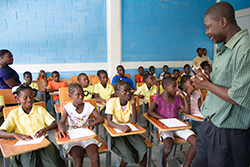 According to Mr Raymond, schooling is the answer – the means to escape poverty and deprivation – for children living in remote areas. 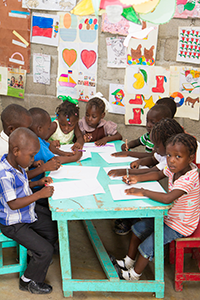 For this reason SOS Children’s Villages Haiti offers literacy-training programs through rural community centres. Laucita Louis lives in a small province near Les Cayes. She works as a laundress to support her family. Although she never learned to read or write, she is glad that her children are learning through the literacy program at the SOS Children’s Villages community center. “I have four kids, but two are at the community center. 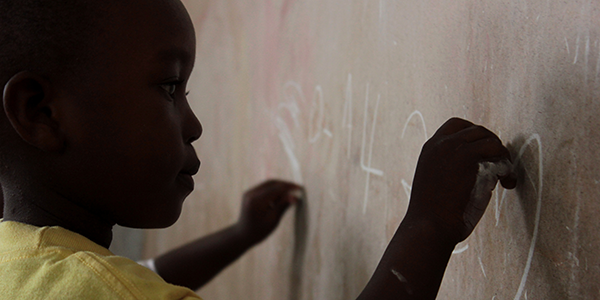 They are getting an education – the first thing a family needs. Second, they get medical treatment and they also receive food,” she said. During the first twelve months following the 2010 earthquake, SOS Children's Villages set up emergency food distribution points throughout Haiti and provided food for 40,000 people every day. After the acute stages of the emergency passed, these food distribution points were turned into community centers, offering a range of social services for children and families.